The Global Volcanism Program has no activity reports for Meager. The Global Volcanism Program has no Weekly Reports available for Meager. The Global Volcanism Program has no Bulletin Reports available for Meager. Mount Meager volcanic complex, of Pliocene-to-Holocene age, forms a dissected andesitic-to-rhyodacitic stratovolcano with multiple eroded summit lava domes and volcanic necks. It lies in the Garibaldi volcanic belt and is the northernmost volcano of the Cascade arc that extends to northern California. The summit of the complex consists of overlapping piles of andesitic lava flows and younger dacitic lava domes and flows. Quaternary basalts underlying the uppermost 22 km of the Elaho valley originated at the 1375 m level in the South Fork Meager River. The most recent activity, about 2350 years ago, produced Canada's largest known Holocene explosive eruption and an associated welded block-and-ash flow and a lava flow from a vent on the NE flank of Plinth Peak. Two clusters of hot springs occur within the complex, which has been investigated for potential geothermal power. Hickson C J, Russell J K, Stasiuk M V, 1999. Volcanology of the 2350 B.P. 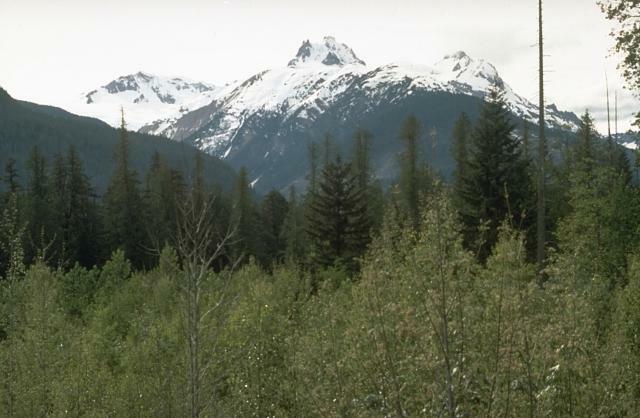 eruption of Mount Meager volcanic complex, British Columbia, Canada: implications for hazards form eruptions in topographically complex terrain. Bull Volcanol, 60: 489-507. Lewis T J, Souther J G, 1978. Meager Mountain, B.C.- A possible geothermal energy resource. Energy Mines Resour Can, Geotherm Ser, 9: 1-17. Michol K A, Russel J K, Andrews G D M, 2008. Welded block and ash flow deposits from Mount Meager, British Columbia, Canada. J. Volcanol. Geotherm. Res., 169: 121-144. Nasmith H, Mathews W H, Rouse G E, 1967. Bridge River ash and some other Recent ash beds in British Columbia. Can J Earth Sci, 4: 163-170. Read P B, 1977. Meager Creek volcanic complex, southwestern British Columbia. Geol Surv Can Pap, 77-1A: 277-285. Read P B, 1978. Meager Creek geothermal area. Geol Surv Can, Open-File 603, 1:20,000 geol map and text. Read P B, 1990. Mount Meager complex, Garibaldi belt, southwestern British Columbia. Geosci Can, 17: 167-170. Souther J G, 1977. Volcano fly-by. Geol Assoc Can 1977 Ann Mtg, Vancouver, Fieldtrip Guidebook 16, 15 p.
Stasiuk M V, Russell J K, Hickson C J, 1994. Influence of magma chemistry on eruption behavior from the distribution and nature of the 2400 B.P. eruption products of Mount Meager, British Columbia. Geol Surv Can Open-File, 2843: 1-38 and 1:50,000 geol map. There is no Deformation History data available for Meager. There is no Emissions History data available for Meager. The Mount Meager volcanic complex is the northernmost major volcanic center in the Canadian extension of the Cascade Range. This Tertiary to Holocene complex has erupted rocks of mafic to felsic composition from at least 8 vents. The most recent eruption produced a pyroclastic flow and lava flow from a NE flank vent about 2350 years ago. 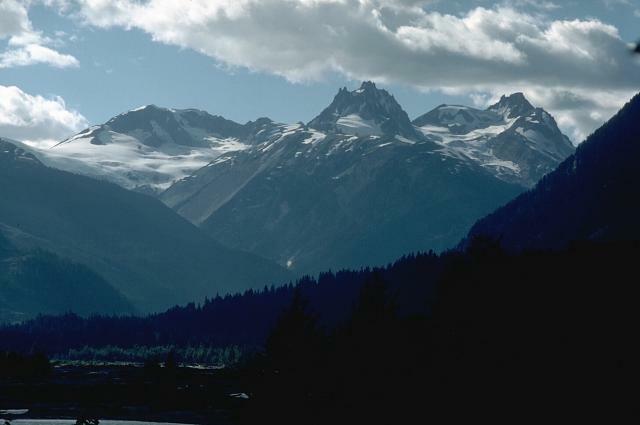 This view from the Lillooet River valley to the west shows, from left to right, the glacially dissected volcanic necks of Mount Capricorn, Meager Mountain, and Plinth Mountain. Photo by Willie Scott, 1990 (U.S. Geological Survey). 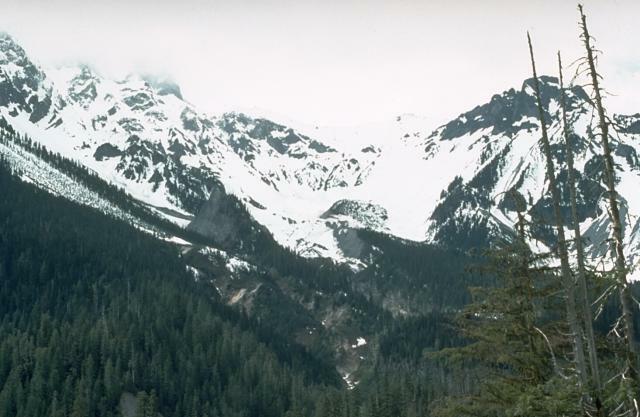 The inconspicuous ice-and-debris covered vent of the Bridge River eruption, the last eruption of the Meager volcanic complex, is located near the center of the photo immediately above the "inverted-V-shaped" forested valley fill. 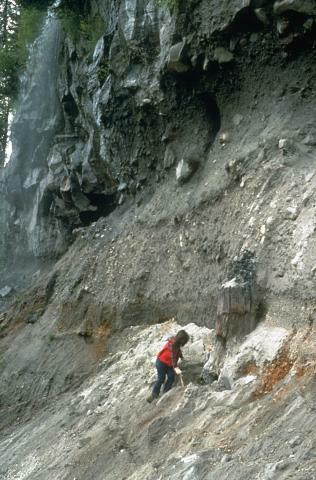 The Bridge River eruption, the largest-known Holocene explosive eruption in Canada, produced ashfall to the east across British Columbia into Alberta. The tree trunk next to the geologist was buried by ash-fall deposits from the Bridge River eruption of the Meager volcanic complex about 2350 years ago, and then overrun by a pyroclastic flow. Its deposit has an unwelded base and a darker, more massive welded layer seen at the top of this photo. 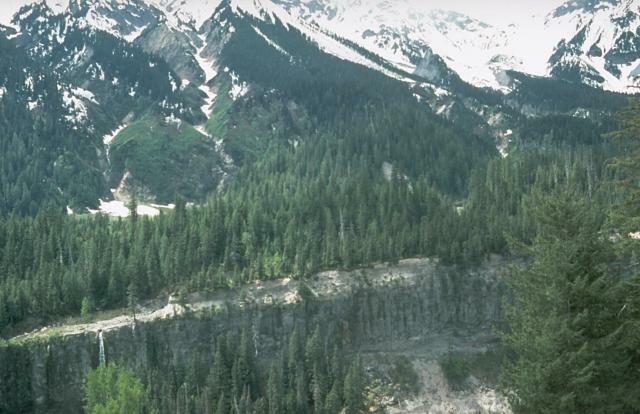 The pyroclastic-flow deposit forming the foreground canyon wall on the Lillooet River was erupted from the Bridge River vent on the NE flank of the Meager volcanic complex. The inconspicuous vent at the upper right below the skyline notch was the source of an explosive eruption about 2350 years ago that spread ash to the east across British Columbia and Alberta and produced the pyroclastic flow seen here and a 3-km-long rhyodacite lava flow. Mount Capricorn, Meager Mountain, and Plinth Mountain, from left to right, seen above the Lillooet River valley to the SE, are three of the 8 volcanic centers forming the Tertiary to Holocene Meager volcanic complex. Deep glacial erosion has exposed the interior of a group of dissected rhyodacite volcanic necks forming the highest peaks. There are no samples for Meager in the Smithsonian's NMNH Department of Mineral Sciences Rock and Ore collection. Large Eruptions of Meager Information about large Quaternary eruptions (VEI >= 4) is cataloged in the Large Magnitude Explosive Volcanic Eruptions (LaMEVE) database of the Volcano Global Risk Identification and Analysis Project (VOGRIPA).